When working on engines, I used to use some wooden beams, but they always slid away. 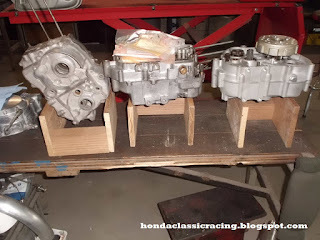 then in the new workshop, I made an engine stand from some leftover bits of hardwood, and this worked so well for me, that I wanted some more, as I get more engines to work on at the same time now. Today I made three more engine stands, with some slight differences, hardwood, so they don't damage what you're working on, but sturdy enough to be able to use an impact driver, and high enough to put a small oil catch can under it for draining engines.